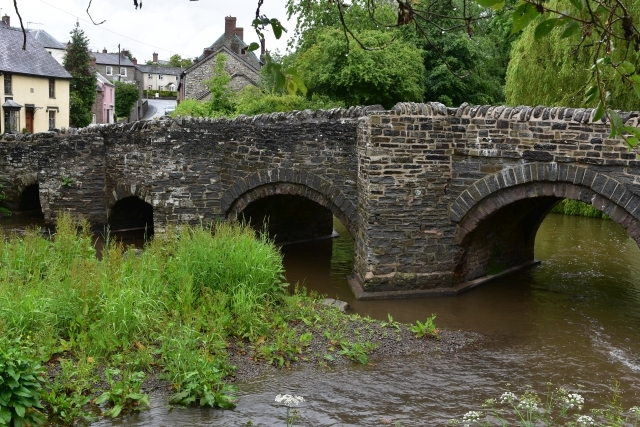 The peaceful rural town of Clun in southern Shropshire has had a chequered past. It certainly hasn't always been the tranquil place we see now. 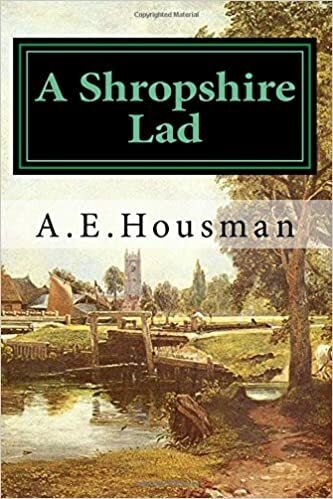 Situated in the borderland between England and Wales, an area known as the Welsh Marches, it was often raided or fought over by the English and Welsh. Borderland disputes were common as evidenced by the many defensive sites that litter the countryside. In the eighth century, King Offa of Mercia built a near 180-mile-long defensive ditch to keep the Welsh out of Mercia, and during the Norman period a long string of castles rose along the border. In later years larger, more important family houses were fortified. Towns grew up in the shelter of those castles and fortifications. Towns like Clun, whose streets and houses are shadowed by the ruins of what once was a strong fortress. 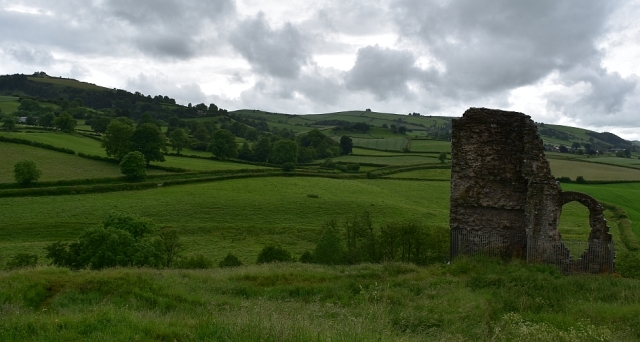 We visted Clun on another wet and showery day during one of England’s typical summers. As we arrived in a heavy downpour and it was close to lunchtime, the decision to retire to the cosy and welcoming White Horse Inn for a fine lunch and a good beer was an easy one. The rain stopped during our sojourn and we got the chance to explore a village that has been described by the Campaign to Protect Rural England as “one of the most tranquil places in England” and by poet A. E. Housman in his Shropshire Lad book as “Clunton and Clunbury, Clungunford and Clun are the quietest places under the sun”. The small community of Clun grew up around the seventh century Saxon church on the southern side of the river of the same name. St. George's church has since been through a number of repairs and improvements, the last being in 1877 when the damage done by Cromwell's forces 200 years earlier was repaired. And in the churchyard you can find the town's oldest "resident": a yew tree that is estimated to be around 2000 years old. The Anglo-Saxon settlement prospered and was established enough to be mentioned in the Doomsday Book survey of England and Wales completed in 1086 for King William the Conqueror. The town is split in two by the river. The older, Anglo-Saxon town lay on the south bank. The Normans built their castle on the northern side of the river and a new part of town developed under the castle's protection. The street layout here is still representative of the medieval Norman grid designed around 900 years ago. 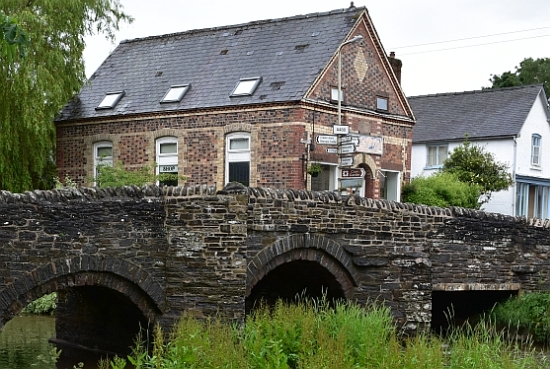 Spanning the river between the Saxon and Norman parts of town is a beautiful fifteenth century packhorse bridge. It’s a lovely place to sit and watch life go by, or to try and spot trout, kingfishers or even otters. Local folk law says “one that crosses the bridge is a wiser person when they come back”. 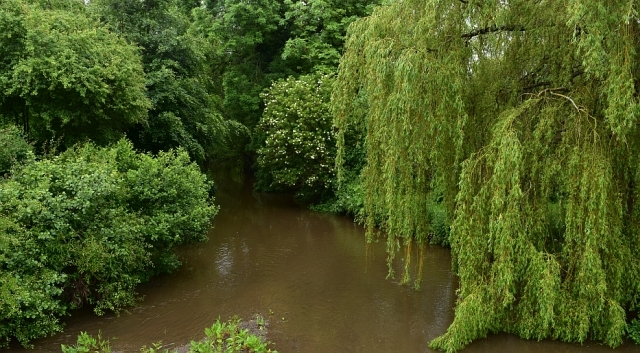 The bridge is also the location of the annual “Battle of the Bridge” between the Green Man and the Frost Queen. 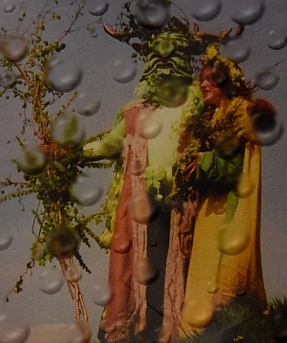 The cheerful Green Man Festival takes place over the May Day bank holiday and the result of the battle, which is on the Monday, will determine if there is a summer or not. Judging by the weather on the day of our visit the Green Man must have lost the battle in 2016! 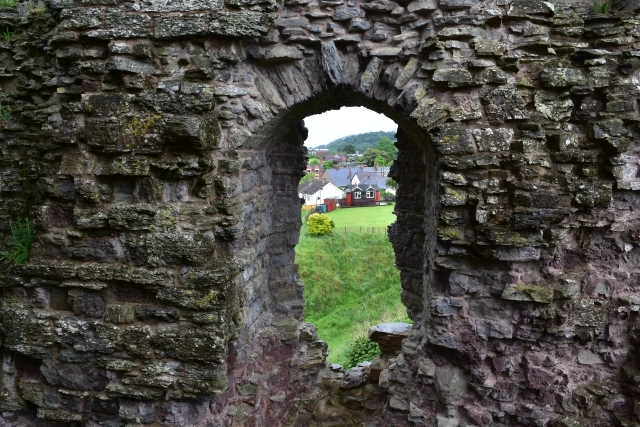 The building of the castle helped Clun become an important settlement which was given town status in the fourteenth century. 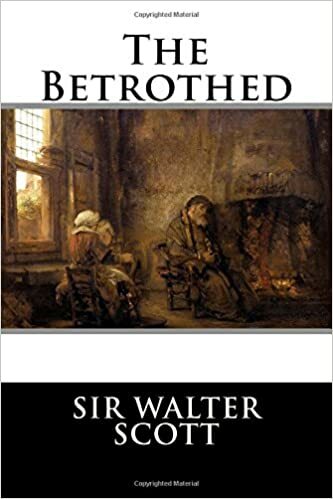 Wealth and further growth then came through the wool trade and Clun grew into a lively market town hosting a famous life stock market and with a long list of different shops, pubs and trades people. Today, as you walk along the streets, you can gather from some of the house names what or who lived in or operated from that property in the past. Along Church Street, you’ll find Cobblers Cottage and Drappers Cottage. On the corner of Ford Street there is Ship House, which used to be one of the town's pubs, and along High Street you get Turnpike Cottage, where road tolls on the Craven Arms road were collected. Other buildings to note are the Post Office and Tea Shop at the bottom of Church Street by the packhorse bridge. Formerly the Temperance Hall, it was built in 1870 using a modern design for the time with bricks of different colours. This was a meeting place for the Temperance Society who were a group of people who eschewed the consumption alcohol. In the same year the hall was built, Edward Vaughan also built the Meredith Temperance Hotel from which he ran the transport and taxi business using his many horses and carts. The Temperance message was quite popular in the late nineteenth century! The Trinity Hospital has an interesting story. Built in 1614, it’s not a hospital as we use the term now, but was charity-run housing for 12 men of good disposition. In effect, it was a row of almshouses, funded by Henry Howard, the Earl of Northampton, and the younger brother of the Duke of Norfolk, the castle's owner. The “Trinity” as it is called now is still in use as age-exclusive housing. Just inside the grounds there is a lovely statue based on two of the former residents. Then there is the old watermill, which is now a Youth Hostel. This unexpectedly is not down by the river, but higher up the hillside and was powered by water from a lake. The lake has since gone and is now a car park. 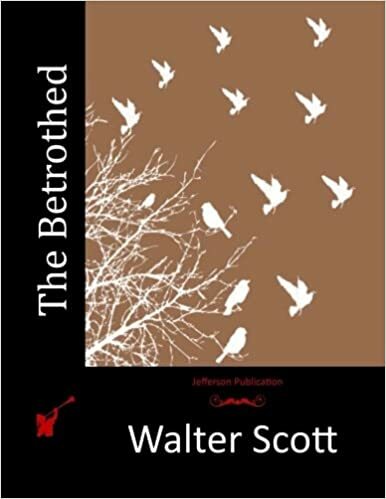 And finally, the Buffalo Inn in The Square has to get a mention as this is where Sir Walter Scott lived whilst he wrote his novel “The Betrothed” which was inspired by the ruins of the towns castle. Clun is not only the smallest town in Shropshire. 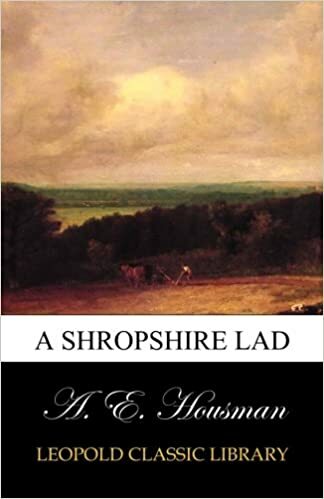 It is also smaller than many villages, and it is the only Shropshire town not to have been connected to the rail network. This may have been the starting point of its decline from an important market town to a very quiet and peaceful town. As transport moved from horse to barges, to railways, and then motor transport, it appears that Clun got left behind. With its remote location it needed to get connected to one of the main transport links to sustain its trade. That didn't happen, though, and slowly the businesses closed down and people moved away. There is a wonderful heritage trail that describes a roughly 90 minute walk which gives you the chance to explore some of the town's past. There is also a museum in the town hall. 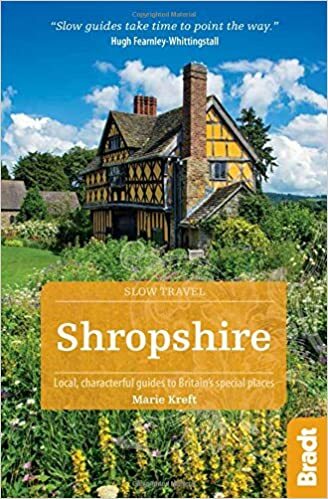 However, if you enjoy country walking, Clun makes an ideal base to start from, and is listed as one of Shropshire’s “Walkers are Welcome” towns. It lies in the Shropshire Hills Area of Outstanding Natural Beauty with some challenging hill walking right from the door. 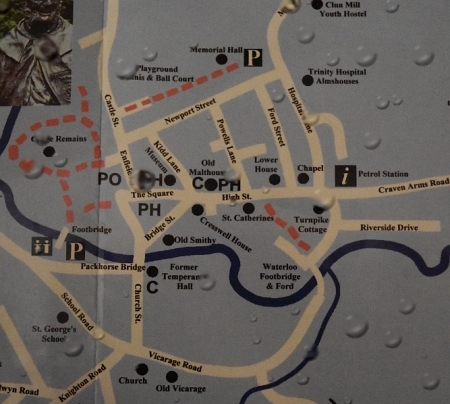 There are a number of detailed walks listed on the town website here. Please use the following links if you enjoyed reading about the town of Clun and would like more information on Clun Castle or would like to explore what to do in Shropshire.